A flawed system of facial translation, on the wall of every hospital hangs a rudimentary pain scale chart of 1-10 or smile to frown. Not taking into consideration a person's culture, gender, or background, while on the surface it might appear to do the job, what the emoji system fails to understand is not only are people being seen in hospitals experiencing some of the worst days of their lives but there's no universal guidebook to follow on how to act that's going to apply to all of us. Whether smiling out of politeness or laughing to keep from crying, we're all just there waiting until the storm passes when we can all go back to our lives. Only there's no pause button during a tragedy and when we come back, we return to our lives already in progress. Hoping to board that roller coaster once again even though it hasn't actually stopped, we soon realize that we have no clue – not even a 1-10 facial translation chart – how we're supposed to act when we don't make it up that first hill fast enough. 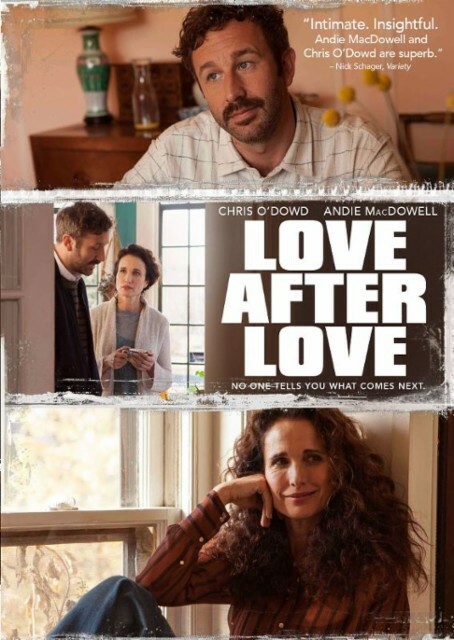 The driving force behind Russell Harbaugh's potent and intensely personal family drama Love After Love, it's precisely this idea of behavior over story and more importantly, how to cope when it all goes wrong that makes this achingly real ensemble piece so compelling to watch. 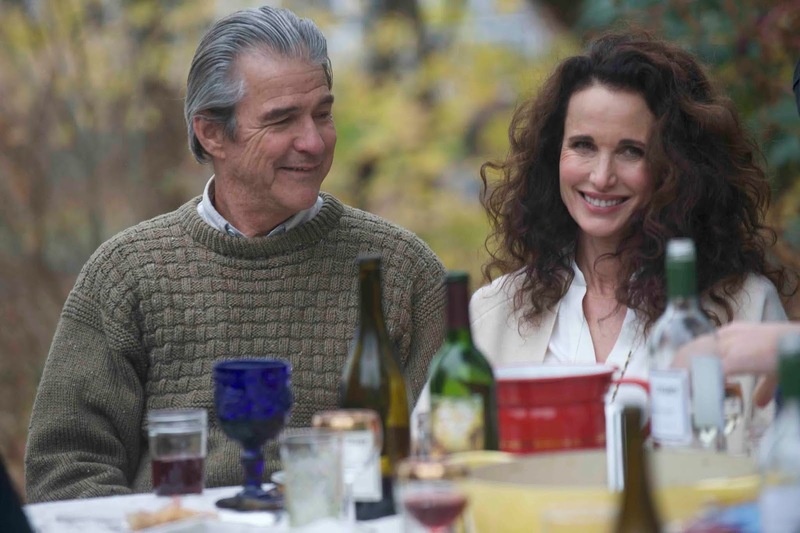 Setting its biggest scenes (including those that bookend the film) at key family gatherings in a way that recalls both Woody Allen's Hannah and Her Sisters and Eric Rhomer's Autumn Tale, Love After Love lets us into the home and lives of a tight-knit New York family before, during, and after the loss of their beloved patriarch. Penned by Harbaugh and his mentor, Judy Berlin director Eric Mendelsohn, as well written as it is, Love is less concerned with what its characters, including widowed mother Suzanne (Andie MacDowell) and her two grown sons, the emotionally needy Nick (Chris O’Dowd) and existentially lost Chris (James Adomian) actually say versus what they do and the way they say it. Performed with gusto by its tremendous ensemble cast (especially a never better MacDowell and bracingly against type O’Dowd), Harbaugh and Mendelsohn respect both the actors and audience enough to skip over scene progressions from breakups to makeups. Jumping right into the aftermath, they trust that we’ll be able to look past the external scale of 1-10 to see what's really going on. And this approach pays off extremely well in a pivotal second act sequence as Nick – having chased and transferred his affections once again to a new fiancé – brings Suzanne and Chris to the home of his soon to be in-laws for a Christmas party. Not nearly ready to celebrate such a major holiday with strangers, let alone listen to speeches about marriage by a man of the house who’s not their own, we watch as Suzanne and Chris initially go through the motions of politeness, smiling at the right time and saying all the things you’re supposed to say. While for Chris the facade soon goes downhill thanks to alcohol, even before we brace for impact, we witness not only the discomfort in Suzanne's eyes but the way she tries to chime in a second too late for it to be genuine (similar to the way we could read between Nick's reactions in act one). Comparing and contrasting their behavior even more through the inverted mirror images of Nick and his fiancé later followed by Suzanne and her own new love (which inevitably causes a grenade to go off in the relationship between mother and sons), the inventive editing by Matthew C. Hart and John Magary adds a rich layer of subtext to Love After Love. Not knowing how to act, let alone address the titular double standard that exists for each familial role, rather than face it head on, they instead try making their way up, down, and beyond the facial translation scale as they move through the five stages of grief. Serving as a terrific showcase for O'Dowd and Adomian as well as a welcome return to substantive parts for the luminous MacDowell, while it's fundamentally Harbaugh's picture, I hope it might also encourage viewers to seek out his co-writer's masterful marvel Judy Berlin. A veritable feature length extension, evolution, and adaptation of Harbaugh's acclaimed roughly twenty minute short, Rolling On the Floor Laughing, which is included on the DVD, Love was overlooked in its post-festival, limited theatrical run. Owing to the filmmaker's age as well as his subsequent collaboration with former/fellow wonder boy Mendelsohn, while Love After Love is much more poetic and mature than its predecessor, Harbaugh's interest in the minutiae of visual storytelling and the way that behavior dictates plot is made abundantly clear in Rolling early on. A chronicle of love after love indeed, although a few of Love's climactic scenes push the dial past authenticity and venture briefly into the realm of the Chekovian stage, Harbaugh's dramatic opus remains just as mesmerizing for those who love theater and literature as much as they do film. Drawing inspiration from his own life as well as Maurice Pialat’s The Mouth Agape for the film overall, while the true test for Harbaugh will be in whatever he delivers next, on a scale of 1-10, I’m not worried at all.